Dr. Rick was comfortably established in a long-standing business career in customer service when his son injured his lower back while serving in the Air Force. The first – and only – treatment approach was, as Dr. Rick says, “to go in and cut.” The surgery was not a success, and his son suffered a high level of pain for years. Dr. Rick and his wife Michelle recently moved to the Pacific Northwest. 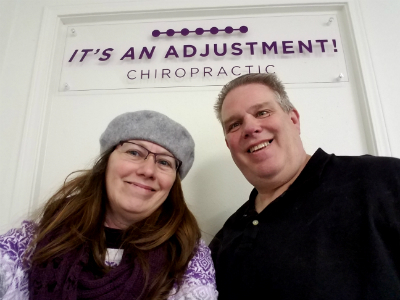 A true partner in life to Dr. Rick, Michelle is actively involved in It’s An Adjustment Chiropractic. While they have lived in a number of places over the years, mostly tied to Dr. Rick’s business career, the move to the Pacific Northwest, with its spectacular beauty, was the first time they moved to a place where they “really wanted to be.” They love the area and are having a lot of fun exploring all that it has to offer. Having spent time in Dallas while attending Parker University, Dr. Rick loves Texas-style barbeque (the process of hot-smoking meat slowly, on low heat) and would be delighted to hear from his practice members about places in the Vancouver area that serve food in that style. Make a choice to achieve your best health—call or stop by today!